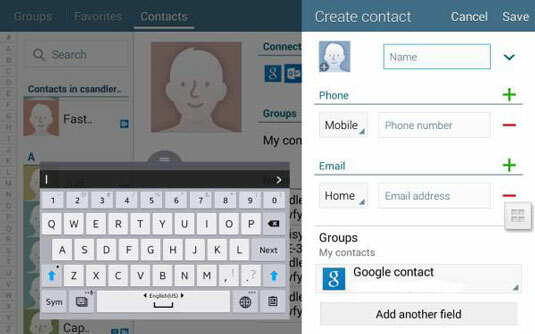 If you already use Gmail and other Google apps, your contacts there automatically sync with your new Galaxy Tab 4 NOOK, provided that you use the same username. Just associate your NOOK with the Google account and you’re good to go. You can open the Apps menu and look for the orange outline of a head labeled Contacts and tap that. Or you may have set a Contacts shortcut on one of the Home screens. You’ll most likely see the listing for “Me” at the top of a panel on the left. That’s Me as in You, created automatically for you. If you want to add more information to Me, tap Set Up Profile. Tap the + icon at the top of the screen. Device. That’s your tablet. If you choose this option, the contact is saved only on your Tab 4 NOOK and not automatically made available for sharing with other listings. Google. The contact is synced with your online Google account. Not only does this create a backup copy of your contact, but it lets other Android devices (such as a smartphone or another tablet) have access to the contact. Samsung Account. The contact is synced with the listing maintained by that company and available on other devices from Samsung, including a smartphone or another tablet. Add a New Account. You can add a Microsoft Exchange ActiveSync account. 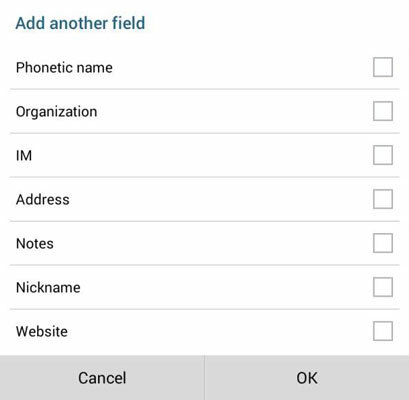 The problem is, if you import from this sort of account and then merge the results into your Android contacts list, the information’s not protected by the cocoon of security at its original location. In a perfect world, use the Google account. Think twice about what information you share, use a tough password to protect your accounts, and change that password often. Oh, and best of luck. After you select a place to store your new contact, the Create Contact form opens. Tap text fields on the Add Contact screen and fill in information. That includes name, phone numbers, and email addresses. Where offered, tap the down arrow to see more fields. If you want to tidy up the contact to remove empty text fields, tap the red – (minus) button. Assign a contact to an existing group, like Family or Friends. Create your own group, like a Human Chess Players Federation group. Tap Add Another Field for more options. Add notes or a field for a person’s nickname. Tap the blank picture space at the top of the contact. It has a plus symbol on it. Tap to select a photo from your tablet’s Gallery. If the person whose contact you’re creating is right in front of you, tap Take Picture to use the tablet’s built-in camera. Crop the picture with the provided tool, if it’s available. The box is square, while nearly all images are rectangular. Something has to give.